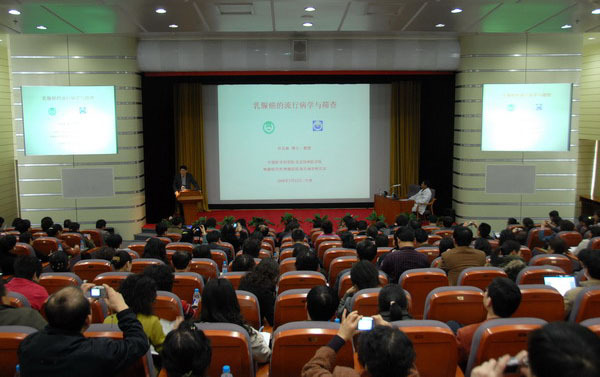 On behalf of the Chinese Bureau for Disease Control and Prevention of Ministry of Health, the Chinese Anti-Cancer Association (CACA) provided training courses of Breast Cancer Screening Project for over 260 delegates. This training course was to promote the Technical Scheme for Breast Cancer Screening Project, and standardize the proceeding of the project. 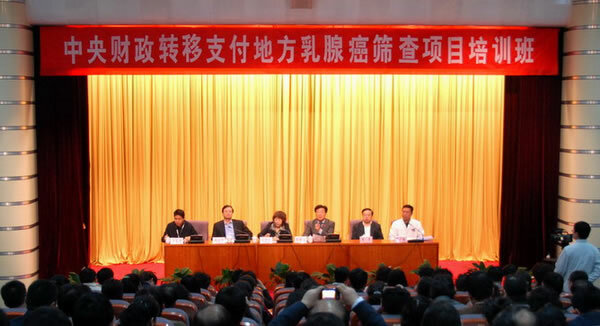 Dr. Xishan Hao and Dr. Guangchao Zhang, the President of and the General Secretary of CACA attended the launching ceremony. Dr. Lingzhi Kong, the Deputy Director of the Chinese Bureau for Disease Control and Prevention and the leaderships of Tianjin Medical University Cancer Institute and Hospital and Tianjin Ministry of Health. On the Launching Ceremony, Dr. Kong pointed out that the central government provided 19.38 million for the Breast Cancer Screening Project. Ministry of Health would supervise the implement of the project and carry out routine inspection and evaluation. The health administrative departments at or above the provincial level were responsible for the coordination, organization, and implement of the project. Dr. Hao as the director of the project introduced in his speech that 530 thousand local women from 30 provinces and 53 districts, aging from 36-69 without Breast Cancer History would took part in the Breast Cancer Screening Project voluntarily. The objects were selected by multistage random cluster sampling and invested with mammary molybdenum target X-ray radiography and breast ultrasonography. The aim of this project was to popularize the breast cancer knowledge and to detect a proper breast screening way according to the biological character.